When I first got into underwater photography I was told that it is not a question of if an underwater camera will flood, it's when the underwater camera will flood. I was also told that even one little drop is a flood. If that's the worst thing that happens on this trip, I will be just fine. Thanks for all the emails about the storm back in Chicago. Sorry to say that is just what I wished for! I hear that there was a killer snowball fight in Lincoln Park though. I hope it was fun! The diving has been incredible. We can do shore dives anytime we want off of the house reef and there are three boat dives a day. 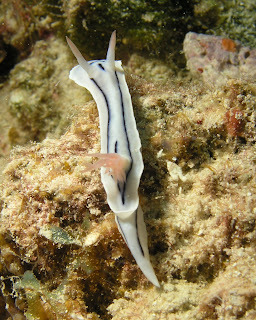 Over the last two days I significantly increased the Nudi Count! Any of you malacologists out there let me know if I'm off on the identification. I can always use the help. This nudibranch is in the aeolid family. 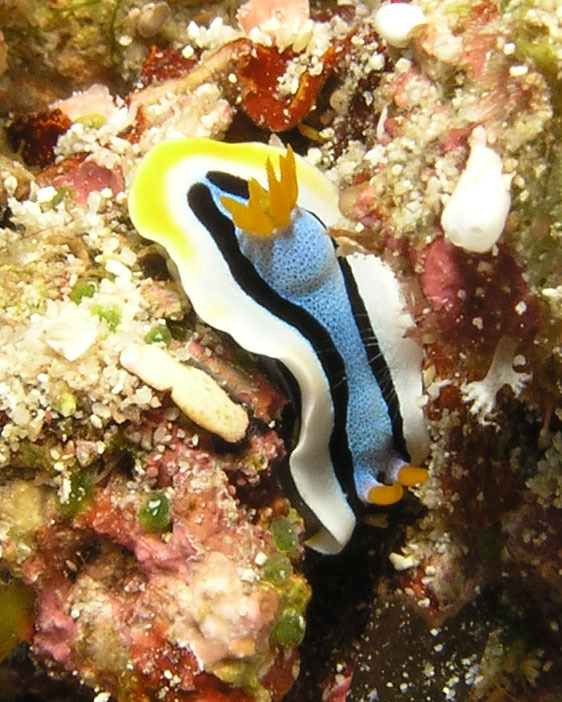 The cerata are filled with toxins and are brightly colored to warn their potential predators. 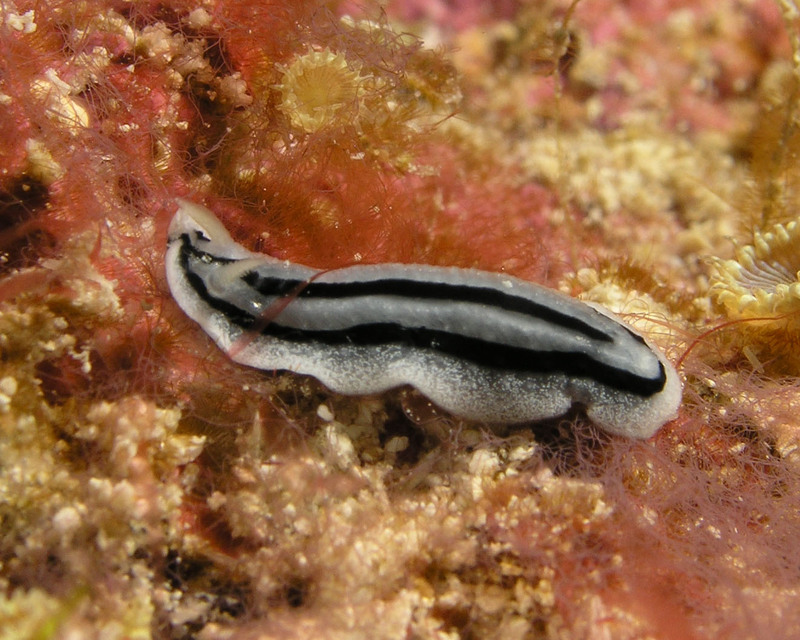 Look closely, this one does have rhinophores (to the left) but no gills. 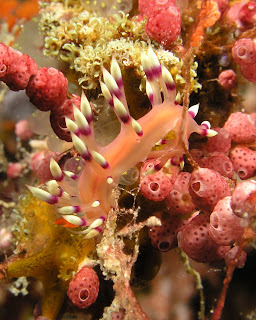 Not that any nudibranch is boring, but this one is the most common. So common I really didn't even have a good photo of one. Underwater, the spots are green. When you put the strobe on them they become purple or pinkish so that they sorta look like a strawberry. In Kona we used to call them the Strawberry Nudibranchs. If you haven't figured it out yet, nudis are named in Latin and often are named for the person that discovered it. I assume that this one was dicovered by Anne. 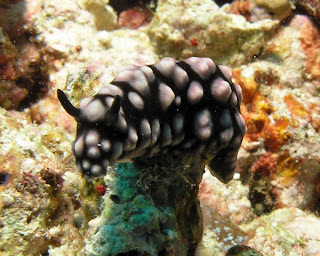 This is my favorite nudi. It is the same one featured at the top of my blog. In Truk, they called it the Neon Star nudibranch. I'll work on a better shot this trip! 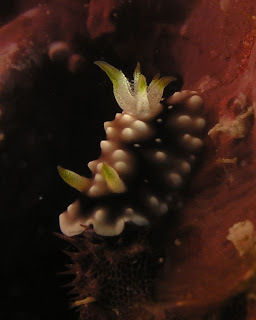 I like this one because if you look closely you can see little dots in its rhinophores and gills. I love the style of diving here. It's almost as easy as a liveaboard. The only difference is they don't fill to your tank so they have to unassemble your gear each time... but the nice thing is that I don't have to do, the staff does! My dive guide is named Dollar. 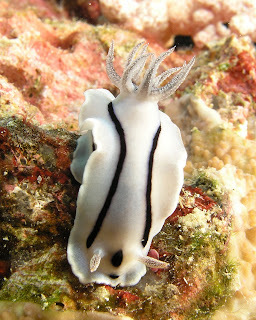 He is a local Indonesian and very friendly but he doesn't get all of my jokes... which is OK. As long as he finds me nudis. I have been paired up with this friendly Scotsman who works in IT in London and has been traveling around New Zealand before coming to Wakatobi (for his second time). It was his 300th dive yesterday! Dollar only takes four of us down at once which is really nice. This is definitely NOT a cattle boat. I am a little disappointed that there are only three planned dives a day. That means that I need to solicit a dive buddy to go on the house reef with me for either an afternoon or evening dive to get up to four. Last night I crashed a night dive with a brother/sister team from Michigan named Kim and Gary. We had sooooooooo much fun! We saw lionfish when first got in. A Chromodoris willani nudi, a moray eel with big bite marks on its head, a banded sea snake that followed us (and made us a bit nervous - they are poisonous but can't really get their mouths around anything to bite). We got an ocellated lionfish to pose for us, then a white flatworm and two banded pipefish. Just to make us hungry for dinner, we also saw a bunch of spiny lobster and then one slipper lobster. Kim spotted a great white leaf scorpion. As I examined it more closely, I realized that there was also a smaller black one behind it. What an interesting shot! I will also post the good non-nudibrach shots at some point, but for now I'm staying loyal to my purpose. Identifying and photographing Nudibranchs. WOW! How fortunate you are and how fortunate we are that you share. Thanks! I'm so jealous. Hope you are having a great time. You picked the perfect time to leave. The most fun a girl can have with her wetsuit on! You are so "nudi-ful" to me! 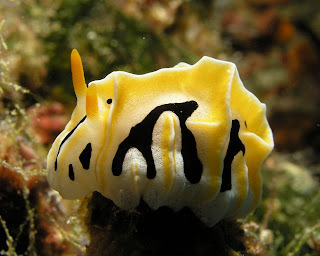 I've died and gone to Nudi Heaven.